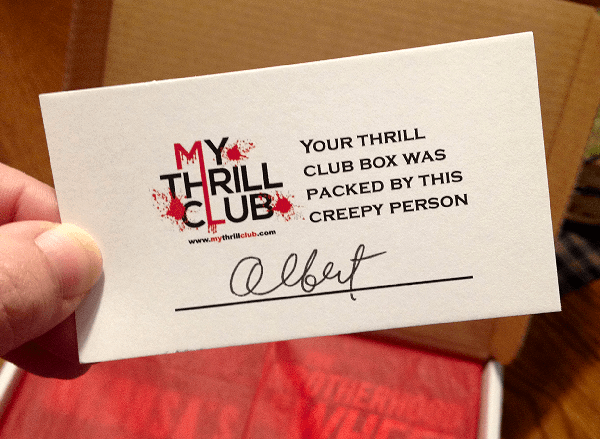 It is finally time for the unboxing of the latest My Thrill Club box! Naturally I’m continuing with the horror edition of the box. Now technically I got the box itself very early in the month, however I was awaiting the monthly newsletter to finally come out so I could receive the code for the free eBook via BookShout. I was actually expecting to only receive one code in the newsletter this month, but they gave a code for each of the genres they distribute (horror, thriller, and mystery). This time around I’m going to skip mentioning costs, but if you want me to do it in the next unboxing post let me know in the comments below. In the meantime, here is what I got. I shall link all book titles to their Amazon listing for your convenience in checking them out. First thing is first, I remembered before I cracked open the box that we were no longer going to get info cards. Instead we were getting a card that focused solely on the person who put the box together. Albert packaged my box up. Thank you Albert! Next step was of course removing the beautiful red tissue paper and revealing the books I received this month! As you can see from the picture I got Medusa’s Web by Tim Powers, and The Brotherhood of the Wheel by R.S. Belcher. Seriously both of these books sound so good! I really don’t know which to read first between the two. Granted that is not a bad problem to have. I’m definitely pleased with the books I got this month… though I don’t think I’ve ever really not been happy with this box. Onto the eBooks! As mentioned at the beginning, three codes were given in the monthly newsletter – one for each genre. Being the bibliophile that I am, I simply couldn’t resist using all three codes. 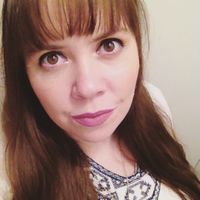 The horror selection is Necromancer: A Novella by Lish McBride. The mystery selection is The Amersham Rubies: A Holly Murphy Story by Rhys Bowen. The thriller selection is A Chunk of Hell: A Bonus Prequel Story to Pitch Dark by Steven Sidor. Again I am overall rather pleased with what I received in my box this month. 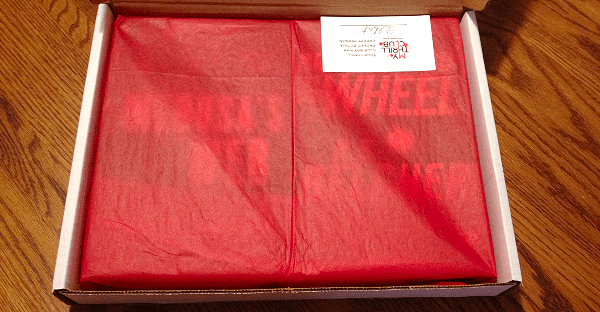 If you want to check out this book subscription box for yourself, just head over to MyThrillClub.com – this is not a hook. I make no money or gain benefit in any form from the links you click on in this post. 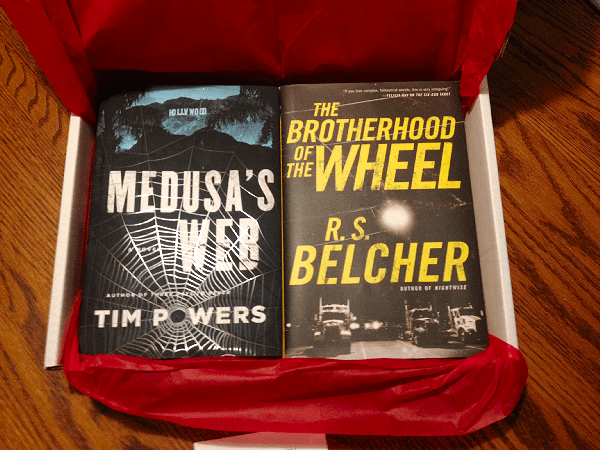 I’m just happy to share a good book subscription box.